What Birdseed Blends are Best for My Yard? Backyards are not all the same, with different types of habitats affecting which types of birds live in them. For example, a house in the middle of an old stand of woods may see many species of woodpeckers, yet a house in a newly developed, treeless subdivision is not likely to see any woodpeckers at all, but may have plenty of goldfinches coming to visit. And then there are all those yards that fall somewhere in between. Using more than one blend can attract more species. Stop by and let us help you decide which blends are best for your yard. • The blends we stock are all selected specifically for the birds in Illinois. • We keep it fresh. Two deliveries per week means we don't have seed sitting in a backroom for months. • Shells have been removed, so there will be no accumulation of debris below your feeders. • Because you aren't paying for inedible shells, these blends are more economical to serve. This version is designed for feeding birds at on tray-style feeders or on the ground. 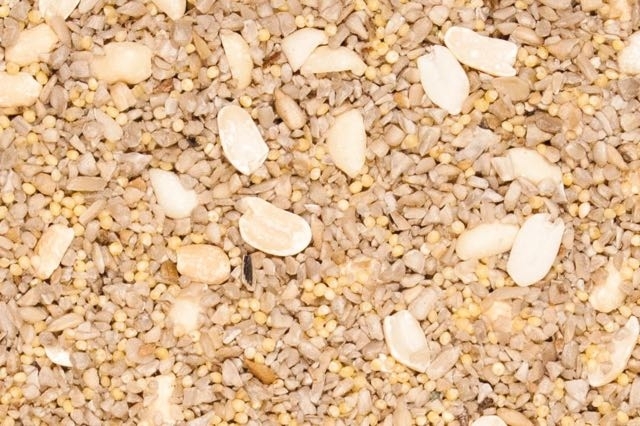 This No-Mess recipe contains sunflower chips and peanut pieces, preferred by arboreal birds, and millet and cracked corn, enjoyed by ground feeding birds. This version of No-Mess can be used in a wide variety of feeders. It has a higher percentage of sunflower chips and peanut pieces for attracting even more birds at the feeder level. It contains just enough millet to keep the ground feeding birds happy, but a little less than in the above version. Ingredients are chopped small enough to flow through most feeders without clogging. This version focuses on birds up at the feeder level, such as woodpeckers, nuthatches, and titmice. Sunflower chips are combined with a variety of different nuts, Bark Butter Bits, and dried fruit. Calcium is added to support healthy eggs shell and bone development. 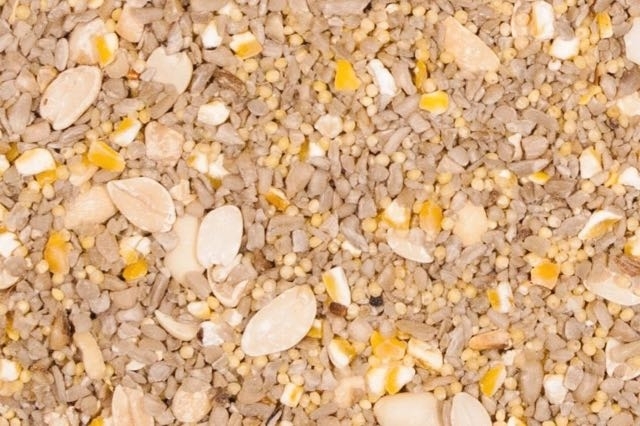 Because there is no millet or cracked corn, you may find this version appeals to fewer sparrows than the version listed above, while also being best for condo and apartment feeding where keeping food off the ground is a priority. This blend can be used in most feeder styles, but is a bit "chunkier," so there may be a few feeders it doesn't flow through as well. 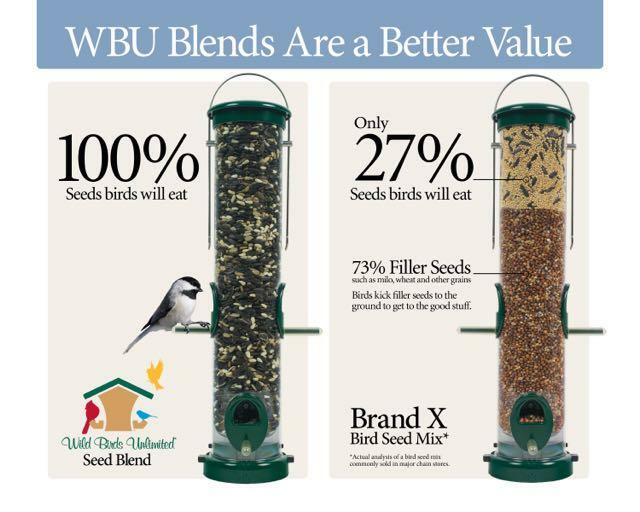 The experts at WBU can help you decide if it's right for your feeder. *When snow is on the ground, Robins can enjoy the fruit and Bark Butter Bits in this blend. 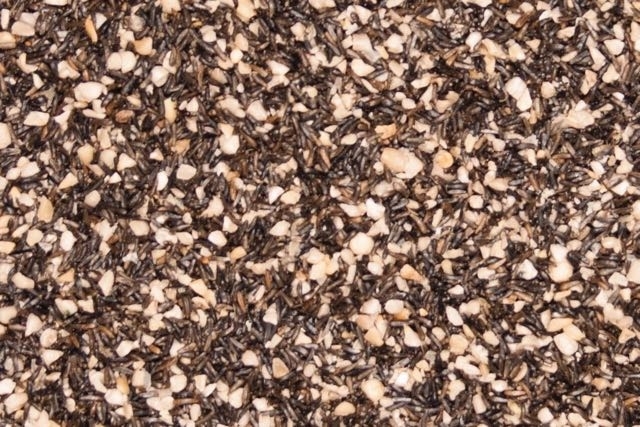 This unique blend contains a high level of protein and fat to boost growth of young birds, while also helping meet the energy demands of busy parent birds. Added calcium supports strong eggshell development. 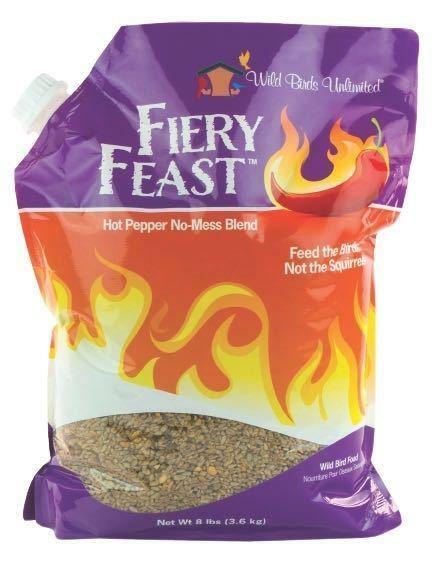 Contains sunflower chips, many types of nuts, and dried mealworms. 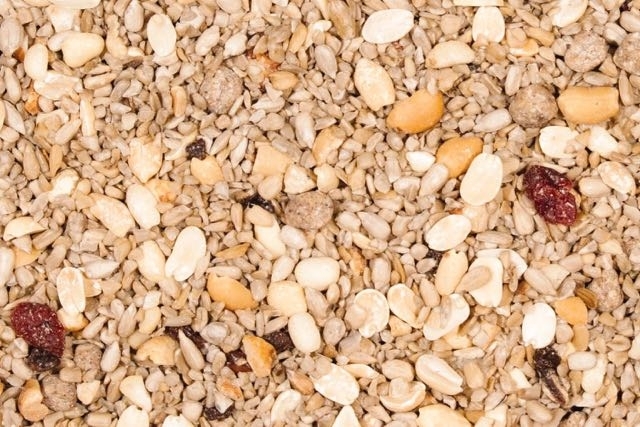 Feed to birds from March, before the start nesting, all the way through the late summer molting season, since protein also helps feather development. 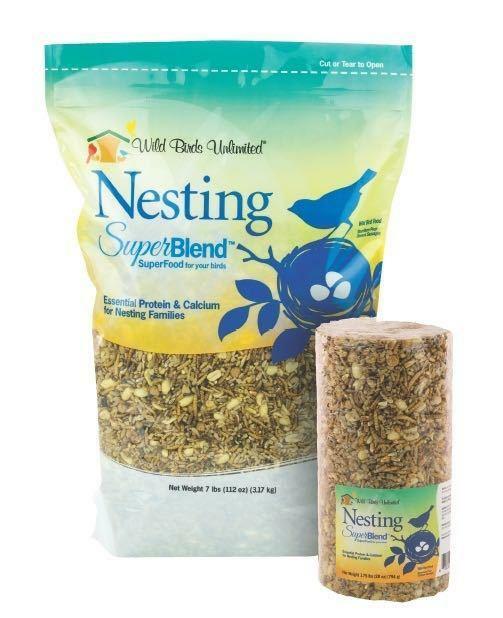 Nesting SuperBlend seed blend can be served alone or mix with your favorite everyday blend, while the cylinder version fits on any of our cylinder feeders. • Colder temperatures mean birds need more calories to stoke their internal furnaces. 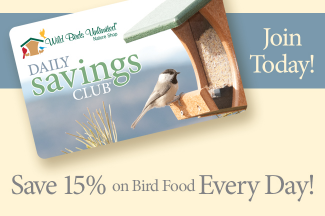 • Shorter days and longer nights result in less time available to forage for foods. Birds can lose a significant amount of their fat reserves every night just trying to stay warm. • Even on moderate days, wind or damp weather can be a hardship. 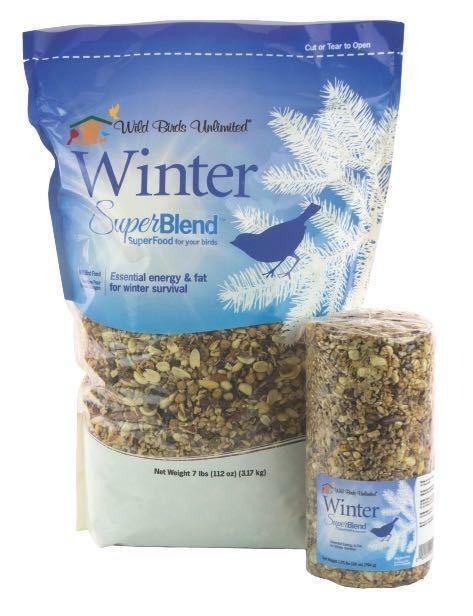 We developed Winter SuperBlend with the highest fat level of any blend because high fat foods offer quick energy, allowing birds to recover from hard nights more quickly and then fuel their daily activities in cold weather. Winter SuperBlend seed blend can be served alone or mixed into your favorite everyday blend, while the Cylinder version fits on any of our cylinder feeders. 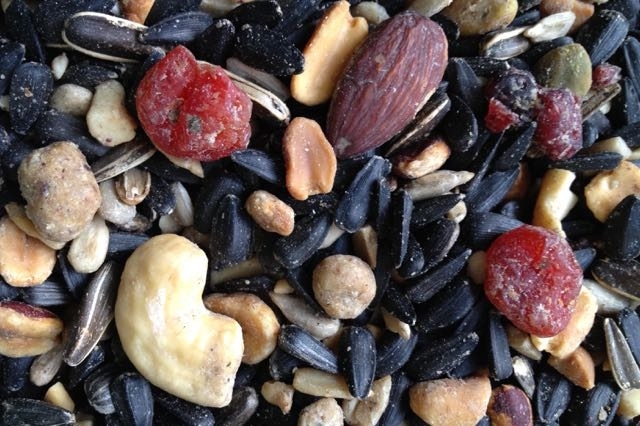 Three types of sunflower, assorted nuts, Bark Butter Bits, and dried fruit will appeal to cardinals, chickadees, nuthatches, titmice, Carolina wrens, robins, mockingbirds, woodpeckers, and more. Calcium is added to support healthy eggs shell and bone development. This blend can be used in most feeder styles, but is a bit "chunkier," so there may be a few feeders it doesn't flow through as well. The experts at WBU can help you decide if it's right for your feeder. While it's definitely a year-round blend, it's one of our a "Top Picks" for winter when snow is on the ground, since Robins can enjoy the fruit and Bark Butter Bits in this blend. Bird lovers who serve only oil sunflower miss out by not offering all three types of sunflower. Sure, oil is popular, but titmice, woodpeckers, and jays prefer striped sunflower, while Carolina wrens and other birds who can't crack shells prefer the shell-free sunflower chips. Springfield Supreme combines all three sunflower varieties, plus we add a nice helping of Safflower, which is definitely a favorite with Cardinals, house finches, and doves. Springfield Supreme is perfect for serving on open tray feeders, which cardinals prefer, or in almost any style of tube or hopper feeder. This is a blend that ideally will be served on a open tray feeder or sprinkled directly on the ground. Containing a generous amount of white millet, intended to attract many species of sparrows (including our native sparrows - the good guys! ), juncos, doves, and towhees, all of whom prefer ground feeding or open tray feeding. 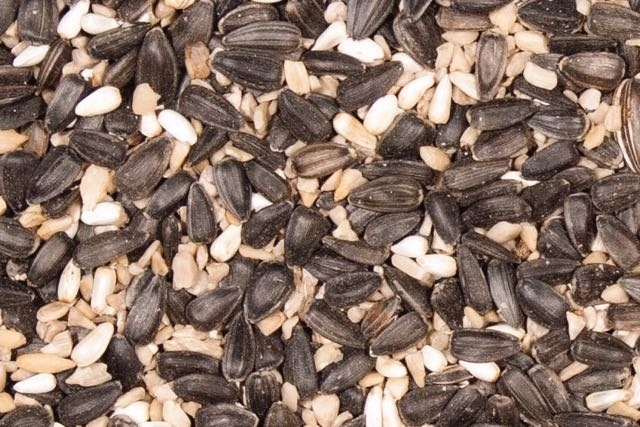 Oil sunflower, striped sunflower, and safflower round out the blend, making it all-purpose enough to attract cardinals, chickadees, jays, and more when used in elevated tray or hopper style feeders. Deluxe is a perfect complement to Choice PLUS or Springfield Supreme blends since the blends cater to different feeding preferences. Finch Blend - more popular than Nyjer! 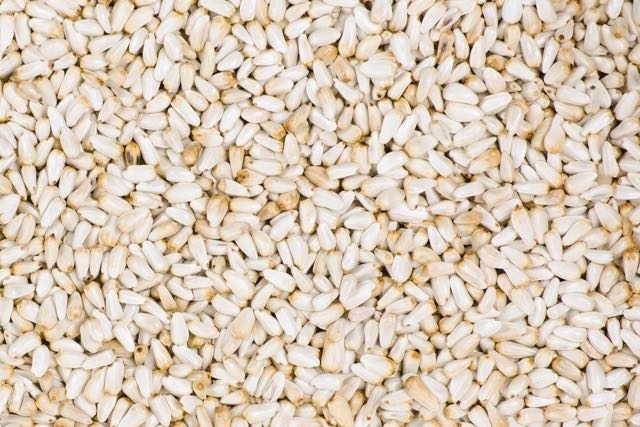 Combining two finch favorites, nyjer and chopped sunflower chips, 70% of our customers find that Finch Mix attracts more finches than nyjer seed used alone. 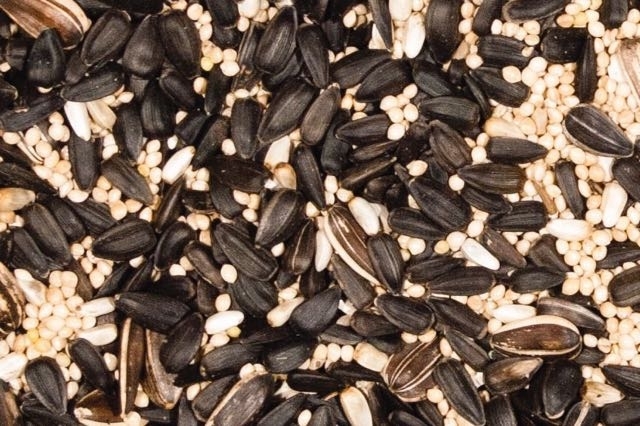 Sunflower chips are 24% higher in fat calories than nyjer, and calories provide energy to birds, making sunflower chips a real boost during harsh weather. The chips in the mix are chopped finely enough to fit through most types of finch feeders. 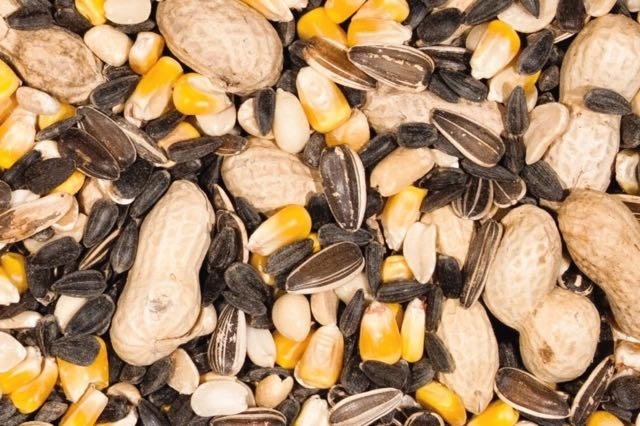 Also referred to as squirrel mix or critter mix, Wildlife Mix has all the peanuts, sunflower seeds, and corn your favorite furry friends will love. Serve in an open tray or our popular all-metal "lunch box (Squirrels can lift the lid to serve themselves, but the feeder keeps blackbirds out. Made right here in Illinois). Wildlife Blend also works well for attracting jays and woodpeckers. Safflower is a great problem solver. Most squirrels and blackbirds just don't care for the taste and will ignore a feeder when the seed is used alone (it will not deter pests if mixed with other seeds). Use safflower in one feeder to attract cardinals, who love it, and one of the above blends in squirrel-proof feeders to get the widest variety of birds. Have fun trying the different blends and seeing what birds you can attract. You may use some blends year round, while others may fill a niche during certain seasons. Stop by and we can help you decide on the best blends for your unique backyard.